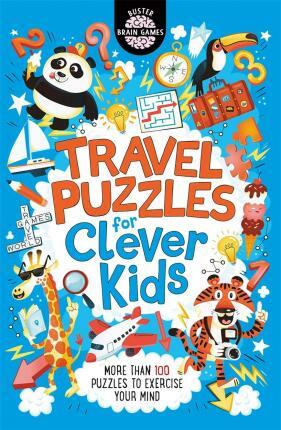 A fantastic follow-up to Brain Games for Clever Kids, this book is brimming with travel-themed logic puzzles guaranteed to keep kids entertained on even the longest of journeys. From airport mazes and round-the-world logic games to capital city conundrums and safari-themed sudoku, there's plenty of exciting puzzles to solve while on the move. Created by bestselling puzzle book author Gareth Moore, creator of the chart-topping success Brain Games for Clever Kids. Dr Gareth Moore (B.Sc (Hons) M.Phil Ph.D) is the internationally bestselling author of a wide range of brain-training and puzzle books for both children and adults, including Anti-stress Puzzles, Ultimate Dot to Dot, Brain Games for Clever Kids, Lateral Logic, Extreme Mazes and The Ordnance Survey Puzzle Book. His books have sold over a million copies in the UK alone and have been published in 29 different languages. He is also the creator of online brain-training site BrainedUp.com and runs the daily puzzle site PuzzleMix.com. Chris Dickason's irreverent sense of humour was born from years as both a mild mannered doodler and angry burger flipper. Taking inspiration as much from Henri Matisse as he does The Muppets, as well as odd bits of packaging collected from foreign supermarkets, Chris' work has been described as charming and visually striking with a sharp graphic style. His illustrations are populated with rambunctious characters that are a cleverly crafted mix of an uncomplicated line style and wonky perspectives.